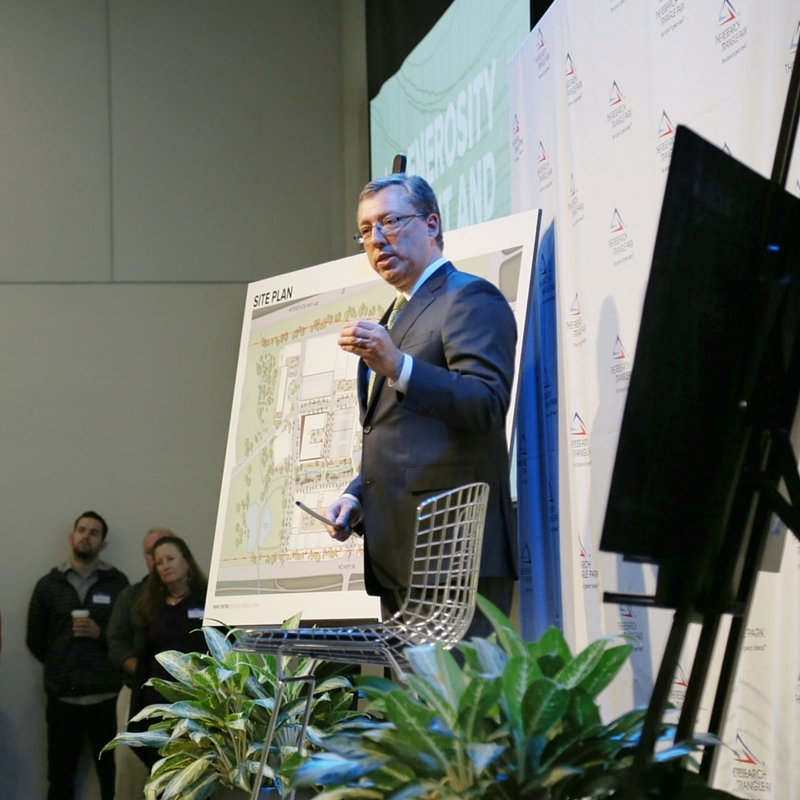 The President and CEO of the Research Triangle Foundation of NC, Bob Geolas, recently announced to a crowd of 200 people that $50M has been secured for the development of Park Center. One day, Park Center will be a great showcase of all North Carolina has to offer. From local food to local arts, this place within the heart of RTP will be a new kind of experience, open to all. The news of a path forward means that mobilization can now begin on the east side of the Park Center development. But, what does that mean, exactly? Well, luckily for you, we’re here to break it down in a little more certain terms. Construction on the east side of Park Center is estimated to provide 2,300 jobs. To be clear, those jobs are just as a result of the construction taking place – it doesn’t factor in the companies, retailers and hotels that will stand on the site in the future. This construction will also generate $13.2M in sales and income taxes. These add up to major winnings for the people of North Carolina. Both Durham County and an advisory board made up of RTP company representatives have allotted funds towards this first $50M investment. Unlike traditional economic development incentives, these funds were derived out of public-private partnerships, meaning all those funds must be used to provide public facing amenities. Think new greenspaces, parking garages and playgrounds. RTP is already full of public trails that are open to anyone to use, and this funding will expand upon that in a new and exciting way. While the plan is to start mobilizing the Park Center site in January 2016, this is very much just the beginning of construction. This first phase of build out will focus mainly on implementing the infrastructure needed to support a project like the East Side development. Think about all the things that make a neighborhood livable: sewer lines, electric, roads, water systems, etc. It’s not the sexiest work, but it’s incredibly necessary to setup the development for success. It will also provide us with a great structure to build never before seen amenities throughout RTP. This kind of work is expected to take about 18 months. After that, potentially beginning mid-2017, vertical construction could begin. This is when people visiting could see buildings start coming out of the ground. While there’s a lot of work that has to happen, there’s no doubt that the end result will be well worth the wait! The organization that manages the Park, the Research Triangle Foundation of NC (RTF), was the original land owner of all 7,000 acres of RTP. Over the years, the RTF has sold acreage to companies interested in operating their own facilities here. Currently, there are about 400 undeveloped acres in addition to the 100-acre Park Center site. Operations, leasing and land sales within Park Center will work a bit differently than other places within Research Triangle Park. RTF has partnered with Houston-based developer Hines in order to help make all the goals of Park Center a reality. Hines will help reach individual development agreements for sites that are going to house many amenities such as housing and retail. Additionally, RTF will also be able to sell or lease sites, as well as form joint ventures within Park Center. This exciting new venture is opening up an array of options that have never been available within Research Triangle Park. The purpose of it all is to be able to focus on creating a new, collaborative destination within the heart of RTP and the Triangle. The Research Triangle Park has been in existence for nearly 60 years. While this format has been working, it’s time for a refresh. Today’s workers want to work in environments that are inspiring and close to many amenities. While RTP isn’t trying to replicate the thriving downtowns that surround the Park, there is very a much a desire to create a place that inspires people to stop and dream when they’re driving along I-40. Now is the time to create a place that will continue pushing RTP forward into the next 50 years, and RTF believes Park Center is the way to achieve that. To find out even more detail about the project, visit https://www.rtp.org/about-us/park-center.